I would suggest that such a thing does not exist and the sooner you free your mind of the notion the better off you will be. I don’t really think there is much difference between the two. Now the first thing I would note is that both 1 and 2 are themselves claims which are often affirmatively asserted. Yet I do not ever hear any proof or evidence that they are true claims. Is this yet another case of a self-defeating claim? It seems so. But before we leave tonight’s Wikipedia I would note that it also says: “The fallacy of an argument from ignorance occurs if, when a claim is challenged, the burden of proof is shifted to be on the challenger.” That’s true but misleading. The Fallacy of ignorance occurs when someone argues that because you failed to provide enough evidence to convince them X is true that lack of evidence should somehow prove “Not X.” So it should be clear that this fallacy in no way justifies a burden of proof. If anything the fallacy of ignorance is a case where people draw faulty conclusions based on the assumption that a burden of proof exists. If one never believed in any burdens of proof then it would be much easier to avoid the fallacy from ignorance. Although I concede that someone can believe in some form of “the burden of proof” and not commit the fallacy of “argument from ignorance”, they are close relatives. For example we can see this fallacy when we read what atheist Kieth Parsons says about Hanson another atheist writer “According to Hanson, the same holds for the claim that God exists. To show that no compelling evidence or cogent argument can be offered in support of God’s existence is tantamount to showing that God does not exist.” Page 25 in his book “God and the Burden of Proof.” This is about as clear a case of the fallacy of argument from ignorance as I have ever seen in a philosophy text. And the fallacy is committed because of the author’s commitment to this imagined burden of proof. Now, if Bigfoot or fairies existed I would expect we would have better evidence of them. They are presumably material things that can be seen, captured, photographed, video recorded etc. It is in part because I would expect that we would have better evidence than we do, that I do not believe they exist. Moreover the existence of fairies or bigfoot has no other impact on my other beliefs such that I should weigh in favor of believing they exist. Notice though I am stating my reasons why I do not think fairies or Bigfoot exists. And indeed that is why I don’t think they exist. I feel no need to resort to claims someone else needs to shoulder some imaginary burden of proof. If someone believes in Big foot and I give him my reasons and he still believes ok. I do not insist that he needs shoulder some burden to prove it to me. He does not have any such burden. Ok I imagine there are some readers who will want to ask me questions like “Do I believe that there are purple and yellow spotted platypuses on planets other than earth? And if not why not?” Well the answer is no, and the reason I don’t is because it sounds made up. Someone asked me “But what if someone who really believes it tells you this?” I’m sorry but it still sounds made up. Perhaps I just grew up with too many people who thought it was entertaining to fool people and so I am a bit distrustful. When my brother first told me about quarks I thought he was making that up too. But either way the person who believed in these platypuses would not have any burden to prove this to me. 1) This is different than saying some “burden of proof” exists. I might hold the belief that we should have a reason for our beliefs without alleging any sort of burden exists on others to prove anything. 2) The problem with the idea that we should always have a reason for our beliefs, is that the chain of beliefs needs to start somewhere. If we have to have a reason for all our beliefs we would either be guilty of circular reasoning, or capable of holding an infinite set of beliefs, or believing things for reasons that we do not really believe, or in a situation where we shouldn’t believe anything at all. There is the logical possibility that all our beliefs stem from other self-evident truths. But I don’t believe that is the case. So right now although I might be sympathetic to the idea that we should have reasons for our beliefs. It seems there are problems with even that claim. If you are still convinced that “the burden of proof” is real, I have a few other questions: 1) What is the standard of proof? (e.g.,beyond reasonable doubt, or preponderance of the evidence or fair probability or clear and convincing evidence? Ect.) 2) To whom do I need to prove the claim? (e.g., a judge, a commission, a jury?) 3) What are the supposed consequences of not meeting this burden? (go to jail or not, win a money judgment, get an injunction move on to the next round of debate in the winners bracket?) These are all very clear in Courts and debates. How does this supposed philosophical burden of proof work? In the end however I believe the notion that others have some burden to demonstrate truths to you does indeed suggest that you are not required to figure it out for yourself. Believing that you are somehow epistemologically justified in continuing to hold your beliefs so long as you decide some other person did not meet some imagined burden of proof is a poor way to go through life. If two people give their reasons for believing opposing views and neither convinces the other, so be it. Maybe one is stubborn or irrational who knows. (see my blog giving a proof of God) Thinking that we should insert some burden of proof never helps any discussion. I think it is intellectually more healthy to place the burden on ourselves to investigate any sort of important question. Don’t try to pass that off on others. Let me attempt to answer some of your questions. 1) What is the standard of proof? The same critical lens you would apply to all other areas in life. Eg. other religions, superstitions etc. 2) To whom do I need to prove the claim? To whoever you are asserting your belief to. Its true that we should be free to believe what we want, but that only applies when our beliefs do not tell others how they should live or what they should believe or it our beliefs cause harm to others. For example, in America, some schools teach creationism in their science lessons. Religious buildings are free from paying taxes, opposing gay marriage, and the lack of separation from the state is why one would need to prove the claim. 3) What are the supposed consequences of not meeting this burden? Your beliefs will not be accepted by non-believers. Simple as that. Hello thanks for posting on my blog. Lets try to think this through together. “1) What is the standard of proof? Ok so you think the standard of proof would be the one *I* apply to other areas of life and other beliefs? But if the person I am trying to convince has different standards isn’t this doomed to failure? Lets use the names from one of your recent blogs that I enjoyed reading. Lets say Tony is the one asserting a claim (or whatever else would supposedly trigger this burden of proof to be on his shoulders) to Don. Are you saying the standard of proof would be whatever standards *Tony* usually accepted? If that is the case then Tony might be able to discharge his burden of proof to Don and yet Don still wouldn’t believe, right? I mean Lets assume Don feels his beliefs in this area need to be proven “beyond reasonable doubt” before they should be accepted. Lets further assume Tony thinks in beliefs of this nature only need to be shown to be “more likely than not true” aka by a “preponderance of the evidence.” Then Tony and Don might both agree Tony proved his belief is more likely than not true but Don still wouldn’t accept it because he is applying a higher standard. In other words Don might say yes you proved it to be more likely than not true but for matters of this sort I need proof beyond reasonable doubt so I will agree you met your burden of proof (since its based on Tony’s standards and not Dons) but I still don’t believe it. Does this suggest that Tony would need to prove this to Don by whatever standard Don believes governs the situation? I, of course, don’t believe in any of this “burden of proof” stuff so I really don’t know how this should work. “2) To whom do I need to prove the claim? But this of course means that Tony’s failure to meet “the burden of proof” is just as likely to be due to Don’s stubbornness, ignorance, emotional attachments, irrational mind, etc. as it would be due to any negative traits Tony has in forming his beliefs. I think we might disagree on this. Someone might believe that no one should be a christian and they don’t think Christians should be able to say a prayer at graduation ceremony. Even though that is telling others what they can and can’t do, I think they are still free to hold those beliefs. “3) What are the supposed consequences of not meeting this burden? If that is all there is too it then why even talk about a burden of proof? I agree that if Tony gives his reasons for believing something and Don decides he is not convinced then Don won’t believe it. But I see no reason to introduce notions that Tony might have met or failed to meet some mythological “burden of proof.” Tony can give his reasons for a belief and if Don listens and still doesn’t believe then ok. Both can shrug and move on. It seems to me that those who support the notion there really exists some sort of burden of proof want to attach some sort of significance to whether it is met or not. Sort of like their is some some sort of epistemic blame that would attach to Tony if he fails to meet “the burden of proof” or some epistemic justification, or smugness, attaches to Don if Tony fails to meet the burden. And vice versa if Tony meets the burden. Why suggest there is such a “burden of proof” if it means nothing whether it is met or failed? I enjoy reading your blogposts as well! Before I can give a reply to your rebuttal, I would need to clarify something. Suppose I say the French Speaking Bear exists. And alot of people believe in it. Then, your government made it compulsory for everyone to learn french in school, instead of English, due to the lack of separation from woods and state. Where decisions are made with the beliefs of the majority. How would you react to this? It would seem to me that everyone in the US would be bilingual, but perhaps their grammar and spelling in English wouldn’t be so good. Would that be a fair trade? That is actually hard to say. But perhaps you want me to assume I was strongly against this for some reason. If that was the case then I would take that into account when it came election time. No. Not yet.Because Christianity wants the bible to be taught as historical, Creationism to be taught as science. For gay marriage to be illegal in most states. So to put it accurately in the french-bear analogy, US citizens will not be bilingual, but will be taught french instead of English from then on. I am starting to think we might be leaving the philosophical burden of proof behind. But I will try to answer your questions anyway. I understood the children would not be taught English in schools anymore. But since most Americans speak English I assumed they would learn it anyway – at home. But maybe you mean how would I react if there was a law preventing anyone from speaking English or teaching English? I guess it is very unlikely that I would vote for such a candidate. He would have to have a really good economic plan, or all the other candidates would have to be very bad. So I think I would react by voting against this person and maybe even contributing time or money to another candidates campaign. BTW I don’t think Christianity wants to teach Creationism. I think certain Christians do but not all Christians. I don’t want to teach Creationism. I don’t want gay marriage to be illegal in most states. I want the states to get out of marriage and divorce all together. I do think parts of the bible are historical others aren’t. I hope I answered your questions and I enjoy talking with you but I am still not sure how it ties in with the philosophical burden of proof. Do you agree that the philosophical burden of proof doesn’t exist and we shouldn’t act as though it does? I truly enjoy our discussions as well! There is a sort of comfort that i find in coming home from work and school to engage in civilized didactic sharing of opinions. Be assured that we are not leaving the grounds of philosophy just as yet. But thank you for your patience in answering my question! The reason why I asked about how you would react to the compulsory french speaking law, being passed due to the seemingly absurd beliefs of the possible existence of a french speaking bear, was to see if you actually believe in the idea of the burden of proof, despite not acknowledging it. 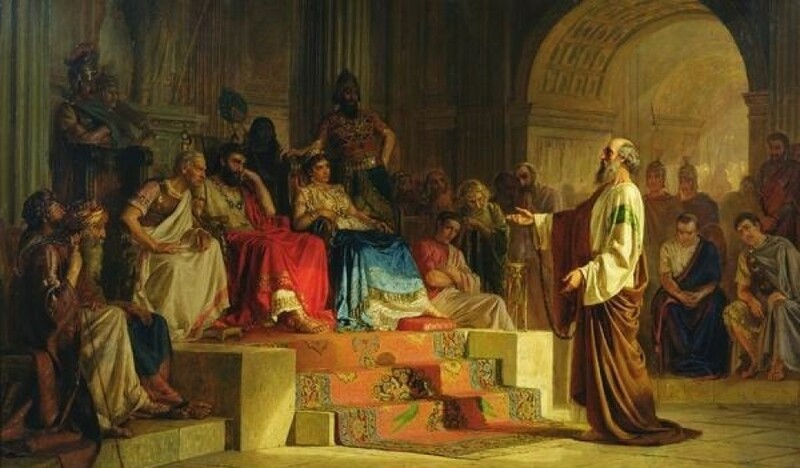 “He would have to have a really economic plan…” This statement shows that you needed a justification for the acts rather than just the belief. In the comments section of part 1 of this blog post you mentioned that you believed in this two statements. 1) I do not believe others need to shoulder any philosophical burden to prove anything to me. 2) I do not believe I bear any philosophical burden of proof, to prove anything to anyone else. I would like you to think carefully and reconsider these two statements. Because you seem to agree as shown above, that you do need a justification, and you do not regard the beliefs of the french-bear believers as a proper justification. Thus, I strongly suspect you actually do believe in the burden of proof but refuse to acknowledge it as that. If the french bear believers all claim that their beliefs are the only correct one, and all other religions are false and they impose high tax on other religious buildings, I can bet you would want them to prove the truths in their claim.I think the burden of proof does exist and I suspect you do too. I’m not sure my statement means anything other than what it says. I probably wouldn’t vote for someone who wanted to ban the English language unless he had a great economic plan (I was sort of joking here) or the other candidates were horrible. Yes I am sure I will have disagreements over politics or religion with someone but that doesn’t mean I or they have any philosophical burden of proof. I may or may not think I need something but my feelings or beliefs would not create a burden of proof. If our desires for justification creates a burden of proof then the fact that the french bear worshipers want me to prove the french speaking bear doesn’t exist creates the burden on me right? Lets assume, for the sake of argument, that I did “want” them to prove the truth of their claims. That does not mean they actually have to do it. They may want me to prove the French speaking bear does not exist. Does their desire mean this philosophical burden comes into existence? Just because you personally deny the existence of the burden of proof, does not mean it doesn’t exist. One can close his eyes when a lion pounces on him, but the lion would still be tearing that person limb by limb. You are carrying the burden of proof and asking for it everyday, though you do not acknowledge it. As for your first 2 sentences I agree. I give you credit because it is an important point that many nonbelievers seem to miss. As for your last sentence, I don’t believe that is true. Because I think the burden of proof is illogically self defeating. Furthermore, to the extent it is not so vague as to be unintelligible, it is a completely arbitrary rule that was simply made up. I try not to really believe in make believe. But are you are suggesting I believe it without believing I believe it? Well I guess I can acknowledge that I don’t know, what I don’t know and leave it at that. So sorry if I sounded rude in the last post, I was actually hoping to bait you out to acknowledge the burden of proof. But I think my statement was not aggressive enough to elicit a strong enough response. My apologies if I came off as aggressive and strong-minded. I understand that you do not see the burden of truth as real, and that you think its made up, but I still do not see how that is so. When you are practicing the use of burden of proof everyday at work. As a lawyer is it not your job to prove to the judge that your client/client’s opposition is guilty/not guilty? You did not appear rude or aggressive in the least bit in your last post. No worries at all. I didn’t realize you meant legal burdens of proof. Yes I agree legal burdens of proof exist in laws and yes I deal with them in my work. The post was about the supposed philosophical burden of proof. But interestingly enough my experience with burdens of proof in the law helps solidify that there is no philosophical burden of proof. Some one is guilty if they are guilty. It doesn’t matter if they found guilty by a jury or judge. And although some burdens of proof have stayed consistent others fluctuate depending politics and public opinion. For example before the Hinckley trial most states required that the state prove the defendant was sane beyond a reasonable doubt. After Hinckley public opinion changed and so now most (but not all) states put the burden of proof on the defendant and require him to prove he was insane by a various standards. The Federal Government also switched the burden after Hinckley for federal crimes. The legal burdens of proof are fairly arbitrary based on the variations of public opinion. I don’t think that bodes well for a philosophical burden of proof really existing. We should understand that the philosophical burden is simply an arbitrary rule that people make up. There is no logical or other reason to believe in it. And in fact it seems to violate logic due to it being self defeating and leading to the fallacy of arguing from ignorance. In any debate/disagreement there are 2 claim makers. One claims “X” another claims “not X” (or “maybe not x” whatever) But whoever you consider “the claim maker” doesn’t matter. It is clear that whoever the claim maker is doesn’t really matter under the law. Because the burden of proof is not the same in all states or the federal government. And the burden of proof shifts based on public opinion. So what you are saying is that the burden of proof does not exist because it is based on subjective human experiences? Do correct me if I am wrong in saying that. You are doing a great job with your blog by the way. I wouldn’t say that is my argument in the 2 blogs that I wrote against it. I think some people who believe in the burden of proof might think its subjective. Others seem to be under the impression that it is a rule of logic like Modus tollens. I hope I gave good reasons for either group to abandon the notion and just think about whatever the issue is for themselves. That means so much to me. Its really nice of you to say that 🙂 I actually just discussed the philosophical burden of proof with my friends and you are right.It does not exist. (As far as we can know) So you were right! However, I do want to point out that the burden of proof on the moralistic and ethical level exists. Do you agree or disagree? about morals like any other subject. to someone else has just as much to do with their stubbornness/open mindedness as the reasons for my belief, I do not feel any burden is on me to convince someone else of my beliefs. What do you mean by the burden of proof on the ethical level? I enjoyed the discussion between both of you. First I read about burden of proof on “trueandreasonable ”; then on “unconfirmedabsolutes”. You both are fine and civilized people. You discussed it very nicely.No ridiculing and no belittling the other; this is how the discussion should be made. Thanks and regards to both of you. I try to be civil Often when it comes to politics or religion the human brain wants to turn off and resort to name calling and ridicule. I try to prevent that with varying degrees of success. I’m glad to see someone observing thought unconfirmedabsolutes and I did a fairly good job of it here. 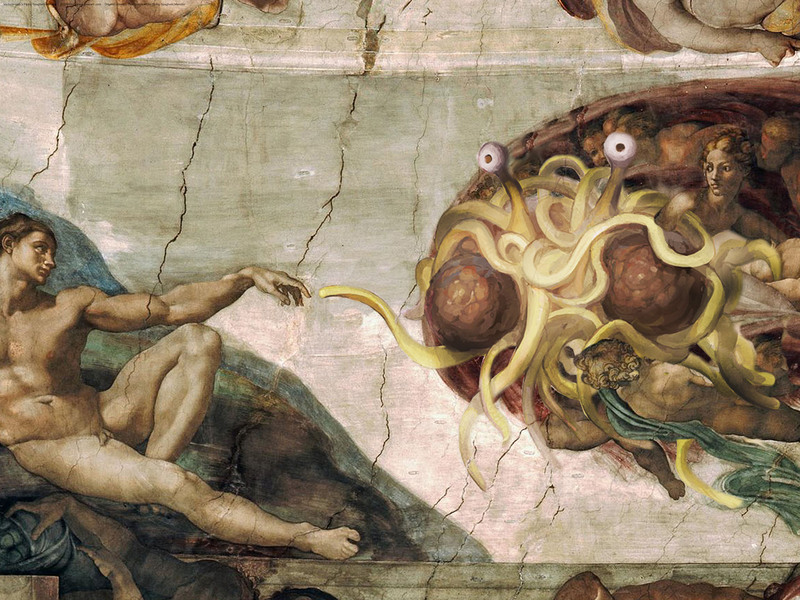 In fact, “the spaghetti monster” can be shown to exist with equal potential, as “a creator,” when outcomes are quantified within an “infinite universal template.” Which, ironically enough, leaves us debating which is more likely – a spaghetti monster who created the universe, or some conscious force of intelligence; not yet perceived thru mathematics, or man’s available measurement(s). Thank you for commenting. And I enjoy reading your blog as well. Paradoxes of the infinite and trying to gain an understanding of it used to be something I was very interested in. But suffice it to say I did not make much headway. I did “publish” and defend a paper that dealt with the infinite – where I drew a parallel between Cantor’s proof that a line segment has just as many points as a long line, and Galileo’s point that a ball traveling down an incline will be at the same speed as a falling ball when they are at the same height. In effect Galileo proved that a shorter line segment has as many points as a longer line segment. I also pointed out this suggests some other paradoxes involving speed changes which are of the same sort that zeno gave with respect to distance changes. Do you study math and the infinite? Here is something that I wonder. Lets say the possibilities are infinite. But you believe one possibility lets call it possibility 472 is more likely than any other of the infinite possibilities. Can that make sense? Or will possibility 472 always have no better likelihood than any other of the infinite possibilities? Yes, very interesting. I would think our experience as human beings confounds the way we view these concepts. The way we, for instance, like to think of infinity as a “quantity,” somehow larger than any other number; which could be broken into smaller parts. In fact, there may be ways of dissecting infinity dimensionally speaking; which somehow divides it, while simultaneously leaving it whole (think of light refracting, existing in multiple locations at once, etc) However, I would say the best means we have for relating to infinity as a “quantity,” would have to be “1” (explained below). Accept that, infinity is not size, or a number at all. It is not spatial, nor is it lacking space. It’s not large, small, or this way,… or that. It is not yesterday, and it’s not tomorrow. Infinity just “is” ….. always, in all ways. It decades since I read through it but it was pretty for people like me who were relatively new to the topic. Lots of fun stuff. I think by saying we do not need reasons for every belief I am accepting that some beliefs are properly basic. I do not think I am rejecting that Idea. And second I think this blog deals with some other background problems with “proving” things to others. But I will offer some thoughts more in depth on your blog. I think we have allot of similar views. Thanks for giving the detailed response. I’ve read a few of your posts, and I must say you seem to be a very open-minded person. A trait that is both admirable and refreshing… And sadly, seems to be in short supply these days. I figured I’d throw in my two cents on the burden of proof, and do my best to answer your three questions. I’ll start with the former. The general rule people use to assign a burden of proof is, as you say, the person making the claim. I disagree with that. As far as I can tell, the burden of proof is self-imposed, by wanting/expecting someone else to change their belief to agree with yours. Personally, I think it’s a misnomer, that it should really be called the burden to convince. For the second question, you only have to prove it to those you want to agree with you. Who you want to agree with you likely depends on the assertion/belief. If you don’t care whether or not others agree with you, then you have no burden to prove it. And lastly, consequences of not proving it. There may be substantial consequences, or none at all. It depends on the belief and why you want someone to agree with you. Are you trying convince lawmakers to make a law, or repeal a current one, or are you trying to convince your friend that chocolate is better than vanilla? I don’t disagree with what you say. We can decide to place a burden of proving something on our selves. It is really this notion that there is some axiomatic law of logic that a claimant has some sort of objective burden of proof that I am trying to dispel. Views along those lines are unfortunately still quite popular and I think lead discussions onto confused sidetracks. As you say, whether or not someone thinks we “proved” something is very subjective. The same proof/evidence might convince one person but not another. You seem to have a good handle on what I am refering to. And I think it is important for anyone who wants to use logic and reason to understand. You are right that sometimes the consequences of not being able to convince someone to your way can have big problems. Sometimes it seems to me that trying too hard to convince someone can lead to problems as well. Logic can lead us to pinpoint where exactly we disagree. It can also expose a problem with someones thought process. But it is not itself evidence of a position. Moreover, logical people can weigh evidence differently. Sound points! I appreciate your point of view. And thanks for commenting on my blog.